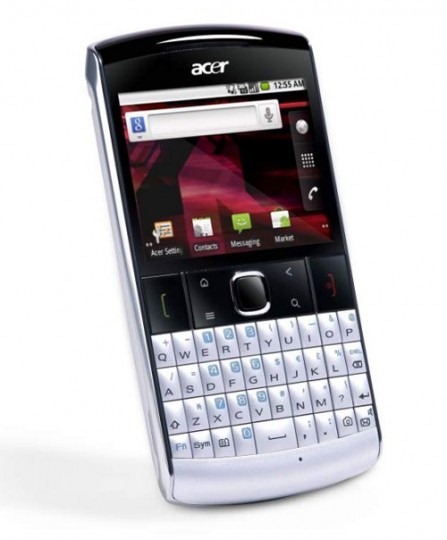 Looks like we might finally start seeing the candybar form factor a little more often [or maybe not, given the specs --Aaron], as Acer has unveiled the BlackBerry-esque beTouch E210. The E210 packs a four row QWERTY keyboard and 2.6" touchscreen into a 115 x 62.5 x 11.5mm chassis. It also includes an optical trackpad for more precise navigation needs. The newest beTouch will be running Android 2.2 on a ST Ericsson 416MHz chip, and packs 256MB RAM and a 512MB ROM. Although it doesn't have significant onboard storage, it does have a MicroSD slot, which you'll need if you plan on snapping pictures with the 3.2MP camera. On the connectivity front, the E210 includes Wi-Fi, Bluetooth, GPS, compass, FM tuner, and a 3.5mm jack. There will be an international and US version packing 900/2100MHz and 850/1900MHz HSPA radios respectively. No word on cost, but hopefully it's not too pricey given the subpar specs. The beTouch E210 is expected to be released in the UK on March 11, with US availability yet to be announced.